of options available to you in Group Policy it makes it a lot easier to administer using a GUI. However since the release of Windows Server 2008 there are Group Policy PowerShell commands available that can help make this process a lot easier. The Get-GPO command retrieves all the information you require about a specific Group Policy Object (GPO). You can retrieve the GPO information based on GPO name, the GPO's GUID or, by choosing the -allswitch, all of the GPOs in the domain. Although you may feel you can get all this information from the Group Policy Management Console (GPMC), the output also lists useful information you might normally miss, such as the owner of the GPO, the time it was created, the time it was last modified and whether everything is enabled or disabled. This is very useful when troubleshooting the creating and editing of GPOs within your network. The Restore-GPO cmdlet restores GPOs back to the domain specified. However if you are using the backup and restore GPO commands as a way of transferring Group Policy objects, you'll need to keep to the same version of the Windows Server 2008 operating system. Non-Windows Server 2008 R2 versions cannot restore Windows Server 2008 R2 GPOs. As with all of the cmdlets mentioned, an extra tool that PowerShell offers is the ability to script the command on a scheduled basis so you can monitor your Group Policy infrastructure more efficiently. 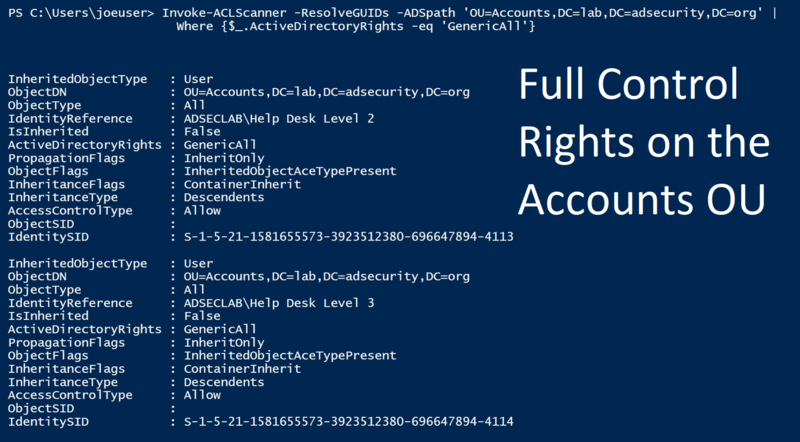 You could also get this information for all of the objects in the ACL, therefore including all admin and system groups as well. With such a simple output this makes it very easy to rule out any permission-based issues when applying GPOs. Enumerating group membership is the easy way to discovering privileged accounts in Active Directory, though it often doesn’t tell the full story. Membership in Domain Admins, Administrators, and Enterprise Admins obviously provides full domain/forest admin rights. Custom groups are created and delegated access to resources. This screenshot shows using PowerView to find VMWare groups and list the members. Allowed RODC Password Replication Group: Active Directory group where members can have their domain password cached on a RODC after successfully authenticating (includes user and computer accounts). Backup Operators: Local or Active Directory group. AD group members can backup or restore Active Directory and have logon rights to Domain Controllers (default). Certificate Service DCOM Access: Active Directory group. Cert Publishers: Active Directory group. DnsAdmins: Local or Active Directory group. Members of this group have admin rights to AD DNS and can run code via DLL on a Domain Controller operating as a DNS server. Domain Admins: Active Directory group with full admin rights to the Active Directory domain and all computers (default), including all workstations, servers, and Domain Controllers. Gains this right through automatic membership in the Administrators group for the domain as well as all computers when they are joined to the domain. Enterprise Admins: Active Directory group with full admin rights to all Active Directory domains in the AD forest and gains this right through automatic membership in the Administrators group in every domain in the forest. Group Policy Creators Owners: Active Directory group with the ability to create Group Policies in the domain. Most organizations use Group Policy to add an Active Directory group to a local group on computers (typically the Administrators group). Using PowerView, we can easily discover the AD groups that have admin rights on workstations and servers (which is the typical use case). We can also use PowerView to identify what AD groups have admin rights on computers by OU. 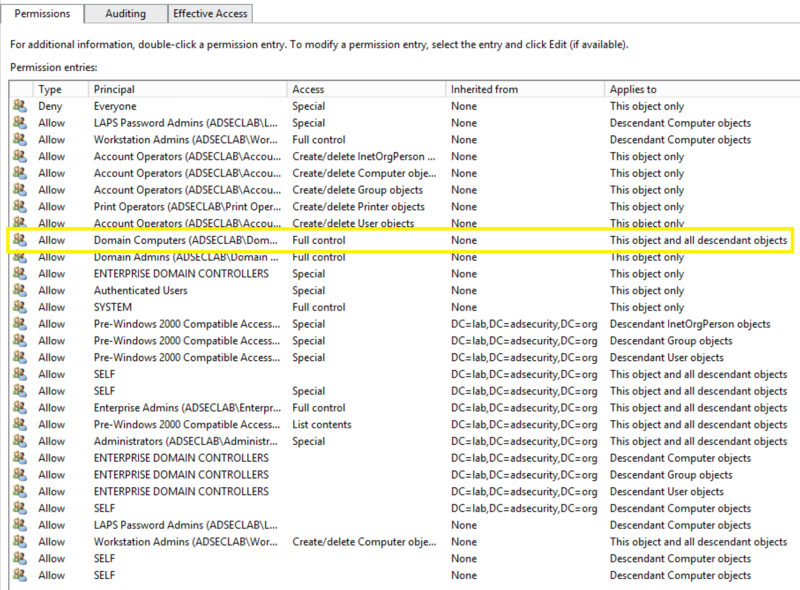 Similar to file system permissions, Active Directory objects have permissions as well. This is translated by the GUI to provide the more user-friendly format we are used to (see screenshot below). 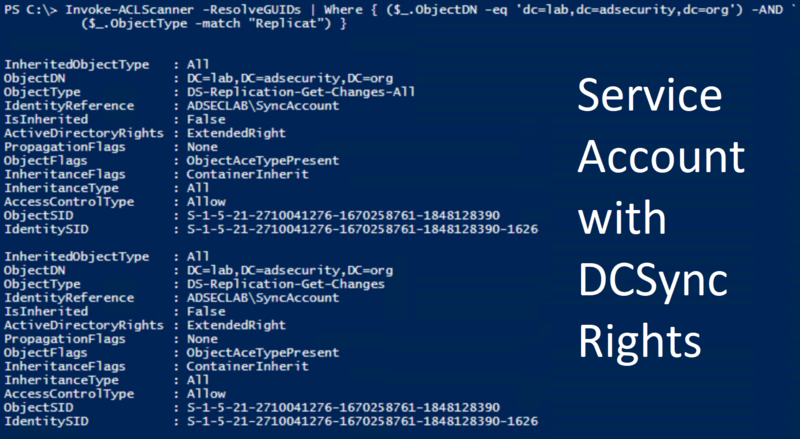 Every Active Directory object has permissions configured on them, either explicitly defined, or inherited from an object above them (typically an OU or the domain) and the permission can be defined to either allow or deny permissions on the object and its properties. When performing Active Directory security assessments, we scan Active Directory for AD ACLs and identify the accounts/groups with privileged rights based on the delegation on AD objects such as the domain, OUs, security groups, etc. Every object in Active Directory has default permissions applied to it as well as inherited and any explicit permissions. Given that by default Authenticated Users have read access to objects in AD, most of their properties and the permissions defined on the objects, AD objects, their properties and permissions are easily gathered. One quick note about AD ACLs. There is an object in the System container called “AdminSDHolder ” which only has one purpose: to be the permissions template object for objects (and their members) with high levels of permissions in the domain. About every 60 minutes, the PDC emulator runs a process to enumerate all of these protected objects and their members and then stamps the permissions configured on the AdminSDHolder object (and sets the admin attribute to ‘1’). This ensures that privileged groups and accounts are protected from improper AD permission delegation. It’s extremely difficult to stay on top of custom permissions on AD objects. For example, the following graphic shows permissions on an OU. There’s a serious issue with the delegation on this OU which is highlighted below. This issue is delegation to Domain Controllers with Full Control rights on all objects to this OU and all objects contained in it. Replicating Directory Changes All: An Extended Right that provides the ability to replicate all data for an object, including password data (I call this the Domain Controller impersonation right) which provides the ability to “DCSync” the password data for AD users and computers.Example: FIM, Riverbed, SharePoint, and other applications often have a service account granted this right on the domain root. If an attacker can guess this password (or potentially crack it by Kerberoasting), they now own the domain since they can DCSync password hashes for all AD users and computers (including Domain Admins and Domain Controllers). It provides full rights to the object and all properties, including confidential attributes such as LAPS local Administrator passwords, and BitLocker recovery keys. In many cases, Full Control rights aren’t required, but it’s easier to delegate and get working than determining the actual rights required. Example: A Server tier group may be delegated Full Control on all Computer objects in an OU that has the computer objects associated with servers. Another common configuration is delegating Full Control on all Computer objects in the Workstations OU for the Desktop Support group, and delegating Full Control on all user objects in the Users OU for the Help Desk. GenericWrite: Provides write access to all properties. WriteDACL: Provides the ability to modify security on an object which can lead to Full Control of the object. Example: A service account may be granted this right to perform delegation in AD. If an attacker can guess this password (or potentially crack it by Kerberoasting), they now set their own permissions on associated objects which can lead to Full Control of an object which may involve exposure of a LAPS controlled local Administrator password. Self: Provides the ability to perform validated writes. WriteOwner:: Provides the ability to take ownership of an object. The owner of an object can gain full control rights on the object. WriteProperty: Typically paired with specific attribute/property information.Example: The help desk group is delegated the ability to modify specific AD object properties like Member (to modify group membership), Display Name, Description, Phone Number, etc. CreateChild: Provides the ability to create an object of a specified type (or “All”). DeleteChild: Provides the ability to delete an object of a specified type (or “All”). Extended Right: This is an interesting one because if provides additional rights beyond the obvious.Example: All Extended Right permissions to a computer object may provide read access to the LAPS Local Administrator password attribute. Andy Robbin’s (@_Wald0) post covers ways these rights can be abused. The ability to create and link GPOs in a domain should be seen as effective Domain Admin rights since it provides the ability to modify security settings, install software, configure user and computer logon (and startup/shutdown) scripts, and run commands. Manage Group Policy link (LinkGPO): Provides the ability to link an existing Group Policy Object in Active Directory to the domain, OU, and/or site where the right is defined. By default, GPO Creator Owners has this right. Create GPOs: By default, the AD group Group Policy Creator Owners has this right. Can be delegated via the Group Policy Management Console (GPMC). PowerView provides the ability to to search AD permissions for interesting rights. SID History is an attribute that supports migration scenarios. Every user account has an associated Security IDentifier (SID) which is used to track the security principal and the access the account has when connecting to resources. SID History enables access for another account to effectively be cloned to another. This is extremely useful to ensure users retain access when moved (migrated) from one domain to another. Since the user’s SID changes when the new account is created, the old SID needs to map to the new one. When a user in Domain A is migrated to Domain B, a new user account is created in DomainB and DomainA user’s SID is added to DomainB’s user account’s SID History attribute. This ensures that DomainB user can still access resources in DomainA. This means that if an account has privileged accounts or groups in its SIDHistory attribute, the account receives all the rights assigned to those accounts or groups, be they assigned directly or indirectly. If an attacker gains control of this account, they have all of the associated rights. The rights provided via SIDs in SIDHistory are likely not obvious and therefore missed. Group Policy Objects (GPOs) are created, configured, and linked in Active Directory. When a GPO is linked to an OU, the settings in the GPO are applied to the appropriate objects (users/computers) in that OU. Permissions on GPOs can be configured to delegate GPO modify rights to any security principal. If there are custom permissions configured on Group Policies linked to the domain and an attacker gains access to an account with modify access, the domain can be compromised. An attacker modifies GPO settings to run code or install malware. The impact of this level of access depends on where the GPO is linked. If the GPO is linked to the domain or Domain Controllers container, they own the domain. IF the GPO is linked to a workstations or servers OU, the impact may be less somewhat; however, the ability to run code on all workstations or servers, it may be possible to still compromise the domain. Scanning for GPO permissions identifies which GPOs are improperly permissioned and scanning for where the GPO is linked determines the impact. Fun fact: The creator of a Group Policy retains modify rights to the GPO. A possible result is that a Domain Admin needs to set an audit policy for the domain, but discovers that an OU admin has already created a GPO with the required settings. So, the Domain Admin links this GPO to the domain root which applies the settings to all computers in the domain. The problem is the OU admin can still modify a GPO that is now linked to the domain root providing an escalation path if this OU admin account is compromised. The following graphic shows the OU Admin “Han Solo” with GPO edit rights. User Rights Assignments are frequently configured in a computer GPO and defines several rights to the computer. Domain Controllers are often configured with User Rights Assignments in the Default Domain Controllers Policy applied to the Domain Controllers container. Parsing the GPOs linked to Domain Controllers provides useful information about security principals with elevated rights to DCs and the domain. Allow logon locally & Allow logon over Remote Desktop Services: Provides logon rights. Manage auditing and security log: Provides the ability to view all events in the event logs, including security events, and clear the event log. Fun Fact: Exchange Servers require this right, which means that if an attacker gains System rights on an Exchange server, they can clear Domain Controller security logs. This means that an acocunt with this user right on a Domain Controller may be able to run DCSync. Enable computer and user accounts to be trusted for delegation: Provides the ability to configure delegation on computers and users in the domain. Fun Fact: This provides the ability to set Kerberos delegation on a computer or user account. In order to effectively identify all accounts with privileged access, it’s important to ensure that all avenues are explored to effectively identify the rights. This means that defenders need to check the permission on AD objects, starting with Organizational Units (OUs) and then branching out to security groups. Enumerate group membership of default groups (including sub-groups). Identify what rights are required and remove the others. Scan Active Directory (specifically OUs & security groups) for custom delegation. Scan for accounts with SIDHistory (should only be required during an active migration from one domain to another). Review User Rights Assignments in GPOs that apply to Domain Controllers, Servers, and Workstations. Review GPOs that add AD groups to local groups and ensure these are still required and the level of rights are appropriate. Confused by this and want some help unraveling the AD permissions in your organization?